Many couples dream of selling up and casting off, but the prospect of downsizing can be daunting. How do you pack your life into some 40ft of LOA after living in a 2,000ft house? Maybe the British-built Gunfleet 43 has the answer. No, you can’t bring your hot tub, but with the capacious stowage both inside and out aboard this bluewater cruiser, you may be able to bring just about everything else. 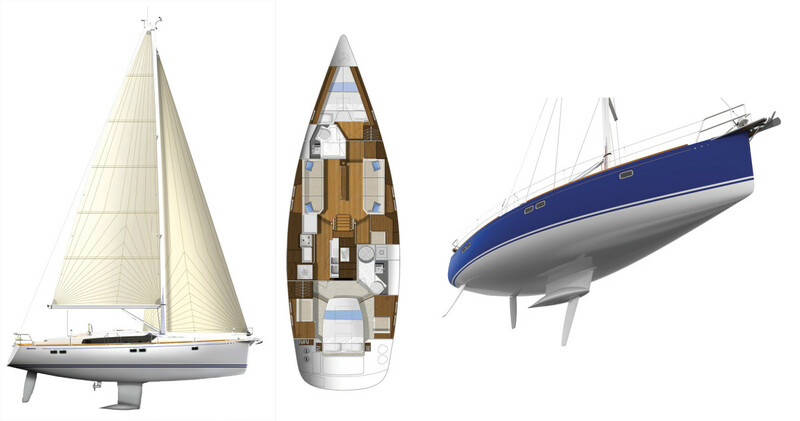 Gunfleet designers teamed up with naval architect Tony Castro to create this modern and sleek, but simultaneously somewhat traditional cruiser. Her hull is laid up by hand in a female mold with bi-directional glass reinforced by Kevlar cloth on the centerline forward of the keel for added strength. Below the waterline, the hull is solid with an integral E-glass and carbon fiber structural grid. The Gunfleet’s standard underwater configuration includes twin rudders and a fixed fin that draws 6ft 4in. However, a variable-draft version is also available and is comprised of a shoal-draft fin drawing 4ft 6in and a 280lb cast iron hydraulically operated centerboard that provides up to 8ft 10in of draft for sailing upwind. The bow is nearly plumb with a protruding double anchor roller. The reverse transom integrates a small swim platform and a three-step ladder up to the deck. The coachroof is low with a wraparound windshield that tapers as it reaches aft toward the cockpit. The overall aesthetic is contemporary with a nice low profile. The most striking part of the Gunfleet 43’s center-cockpit design is the sprawling aft deck section, which includes twin zones perfect for sunbathing. They’re bisected by a hatch and skylight that lead down into the master stateroom below. There’s also an enormous lazarette that will hold lines, fenders, a rolled-up tender and all manner of cruising necessities. Just forward is a compact cockpit, most of which is dedicated to a massive center console, or “flight deck,” with a single Garmin display framed by miscellaneous switches and controls, including the autopilot. Engine throttles are below the console but are attached so you don’t have to reach down to your knees to shift, which can be especially annoying when docking. A basket wheel wraps around this console, which saves room, although it’s a bit tight making your way past it without stepping up onto the settees. Six Lewmar winches control all the lines. Two are on the cabintop by the companionway, two are primaries on the coaming, and two more are located aft for handling the wide traveler and German mainsheet system. End-boom sheeting right behind the helm helps shorthanded crews manage this powerful boat easily. The Seldén deck-stepped, double-spreader mast supports an 11/12ths fractional rig with a traditional mainsail and a slightly overlapping (113 percent) genoa on a manual Furlex furler. Our test boat came equipped with the optional electric in-mast furling main for easy reefing on the fly. Moving forward, you’ll find an undivided anchor locker with a Lewmar windlass. The side decks are narrow, and the lifelines a bit low for offshore work, but the pulpit is nicely split, providing good access when working with the anchor. Teak decks are standard, as befits a boat of this exceptional quality. Workmanship is first-rate throughout. 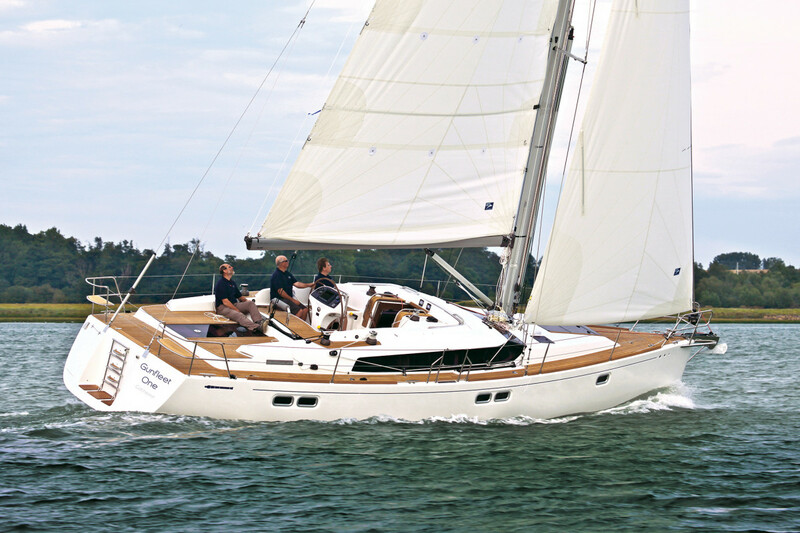 The Gunfleet 43 is a couples’ boat, with two cabins and two heads. A third custom cabin can be shoehorned in amidships to starboard, but then you lose the forward-facing nav station, something that becomes key on long passages. Once you descend the rather steep companionway steps, you’re enveloped in a posh interior of gleaming wood and ample natural light, which pours in through both the windshield and a number of small hull ports. Forward is a V-berth cabin for guests and a wet head that also serves as the day head. 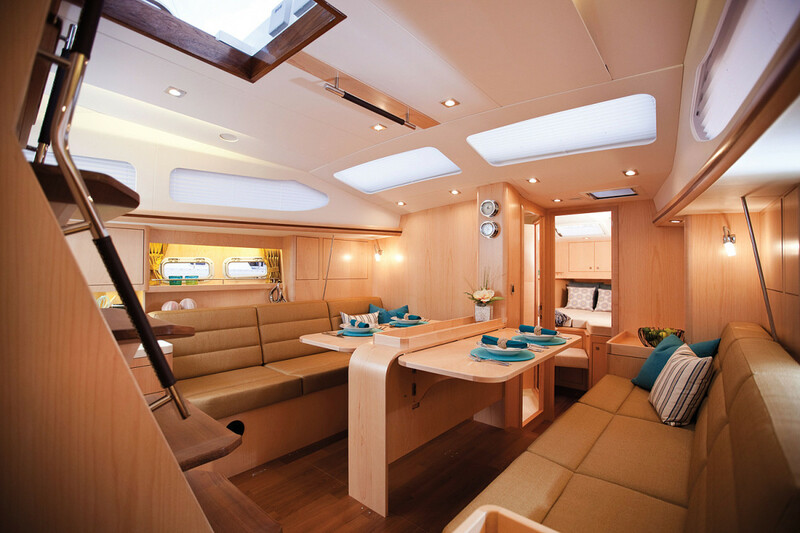 Moving aft, the saloon has straight settees to both sides with a fold-out table in between. The galley is in the walkthrough to the master cabin aft. With plenty of countertop space, lots of cubbies for provisions and dishes, a three-burner GN Espace stove and double sinks, the chef will want for very little. The master suite aft is a thing of beauty, with a large island berth surrounded by plentiful drawers and hanging lockers to store a significant amount of apparel. The master head has a separate shower stall and a chic vessel sink. The skylight and hatch above, in combination with a set of opening hull ports, make the cabin look light and roomy. A nice touch is the lee cloth integrated into the master bunk for comfortable sleeping on passage even when sailing at a substantial angle of heel. Our test boat had a maple finish, although cherry, teak and oak are also available. The joinery is exceptional, and the plentiful lighting adds to the elegance. A CZone digital switching system that manages and displays almost every system aboard adds a bit of upscale functionality. No one will be roughing it on a Gunfleet. Our sail on Chesapeake Bay provided a middle-of-the-road test with 12-14 knots of wind—conditions which were neither too sporty nor dismally light—and our test boat was equipped with the optional shoal-draft keel and centerboard. According to Gunfleet, you can sail upwind efficiently even with the board completely retracted (which will delight skinny-water sailors on the U.S. East Coast), and point it did. In 14 knots of wind, we tacked through 65 degrees and kept up 7.1 knots of boatspeed even when things fell a bit light. Falling off to 120 degrees apparent wind angle with 12 knots of true wind, we scooted along at 5.3 knots. The boat also accelerated nicely out of the tacks, and the helm was responsive on all points of sail. Beyond that, the Gunfleet 43 has a solid feel that will boost the confidence of cruising couples caught offshore in snotty conditions. Auxiliary power is provided by a Volvo-Penta D2 60hp diesel with saildrive. The engine has been turned aft with the four-bladed folding propeller situated directly below the motor, which helps deaden the sound of the prop wash. Engine access is in the galley, and an 8 kW Fischer Panda genset sits just about where the engine is normally positioned. All engine dip sticks and filters are accessible, which will serve to make maintenance tasks that much easier. Weight is kept low, with the fuel tanks and 600 Ah worth of house batteries all on centerline below the cabin sole. On flat water, we motored 7.2 knots at 2,100 rpm. At wide-open-throttle, the engine pushed us along at 8.2 knots while turning over at 2,800 rpm. Tankage includes 100 gals of water and 100 gals of fuel. Close-quarters maneuvering is simplified by the boat’s retractable bow thruster. We sailed hull #6 of this design, which was originally launched in 2011, and ours was the first Gunfleet 43 to reach U.S. shores. Due to the boats’ semi-custom nature, they’re highly personalized and built to order, so you won’t find them stocked by dealers. That said, visits during the build process are encouraged, and for couples looking to distance-cruise a quality boat, the Gunfleet 43 may just what the doctor ordered.